When Balázs and Laszlo asked me to give a seminar covering the Bujinkan themes of the last twenty years (1993-2012) I accepted but I didn’t immediately understand the “why?”, and I must admit that I didn’t see who would be interested. The day before traveling to Budapest I began to be concerned about the “how?”, and in a short mail, I told Balázs that I didn’t know if I could do it as suddenly Iunderstood the vast task it was. But eventually everything went fine and this is a seminar that I would like to repeat anytime. At first covering twenty different themes in two days made the seminar looking like some kind of food buffet where you are tasting many different dishes. But those themes have been chosen wisely by sensei, and the benefits from previous themes are reused after. Each year adding its particularity, was nurturing the next one. If we follow the themes chronologically we rapidly see a logic in the system. Bô calls for Yari and Yari for Naginata. This “Sanshin of long weapons” as Hatsumi sensei called them once, is the best introduction possible to enter Biken jutsu, and Biken to understand Jô jutsu. In fact before the Tsurugi and the Tachi I thought that Jô was the ultimate weapon! This five year cycle (1993-1997) was followed by another five year cycle (1998-2002) focusing on the five different types of Taijutsu: Taihen jutsu, Daken Taijutsu, Koppô jutsu, Kosshi jutsu, Jû Taijutsu. During this period in order to illustrate these different Taijutsu, sensei used respectively the following schools: Shinden Fudô Ryû, Kukishin Ryû, Koto Ryû, Gyokko Ryû, Takagi Yôshin Ryû. Unfortunately very few people understood that the ryû that was taught was the omote and that the type of taijutsu taught through the school was the main thing. These first ten themes (1993-2002) taught us the various sides if what sensei called “Budô Taijutsu”. Once the foundation of Budô clearly established, sensei put “Ninpô Taijutsu” on top of it. This was the beginning of Juppô Sesshô. As he said to me once: “the five different styles of Taijutsu are the expression of Budô Taijutsu; but Juppô Sesshô is the expression of Ninpô Taijutsu”. The next ten years (2003-2012) have been dedicated to Juppô Sesshô. We began with five years of “Omote” Juppô Sesshô (2003-2007), they were then followed by five years of “Ura” Juppô Sesshô (2008-2012). The Omote Juppô Sesshô was based on the body, the themes were: Sanjigen no Sekai, Yûgen no sekai, Kasumi no hô, Shizen, Kuki Taishô. We studied various weapons and schools during this cycle but only to put into evidence the concepts brought by sensei (kunai, shotô, biken, bô, yoroi etc). The Ura Juppô Sesshô is more about the soul, the mental side of the movements: Menkyo Kaiden, Saino konki, Rokkon shojo, Kihon Happô, Kaname. Once again we had to “listen” to sensei and understand the movement from the level of perception and not with our analytical mind and mechanical movements. In fact it looks like a birthday cake with several levels. 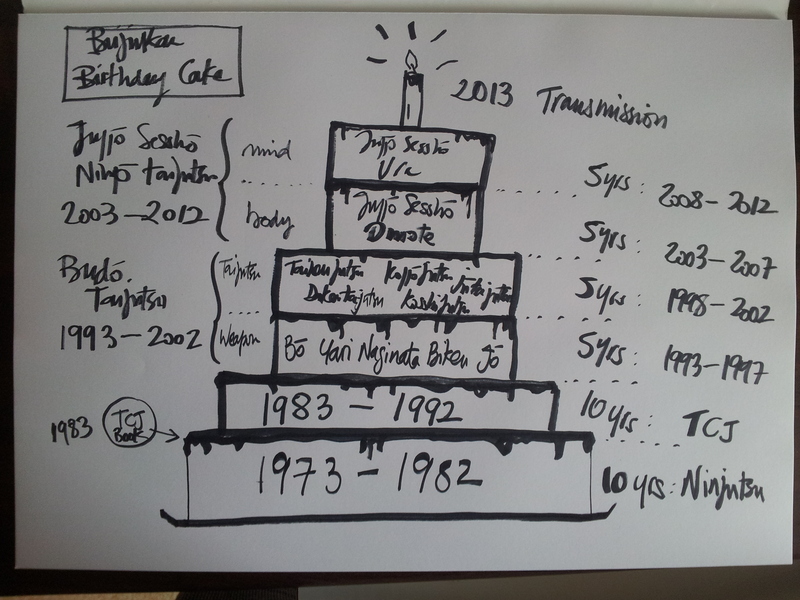 And in 2013, the Tachi hôken illustrated by the Tsurugi is like the candle on top of the cake. At the birthday party the cake is always good but what really matters in a birthday party, what is the most important thing is not the cake but the reason why people are gathered to eat it! *we had training from 10am to 6pm on both days which left more or less 40 minutes per year of training… that was intensive. Mil gracias y un fuerte abrazo por tu Gran Labor. Thousand thank you and a strong hug for your Big Work. The seminar was truly amazing. Although I am fresh in the Bujinkan world it was really worth it, it taught me an awful lot! What do you think will come after the “Transmission” ?